the type of vehicle and the demands of the vehicles brake system. the ability to withstand these temperatures and not degrade rapidly. somewhat common in show cars. this increases the feeling of a spongy pedal. dramatically decrease a brake systems performance. Fluids containing Poly glycol ethers are regarded as DOT 3, 4, and DOT 5.1.
performance ability of the fluid also decreases. performance of the brake system. points. Wet boiling points generally remain the same. temperatures that brake fluid will begin to boil. system contains 3% water by volume of the system. trapped in the internal sections of calipers, lines, master cylinders, etc. water/moisture may enter the system. Diffusion occurs when over time moisture enters through rubber brake hoses. greatly reduce the diffusion process. used in a racing brake system. will most likely not contain water. Because of this, racers should be concerned with the dry boiling point. Racing fluid exceeds DOT 3, 4, and 5.1 dry boiling point specifications. Never use silicone based fluids in racing brake systems. 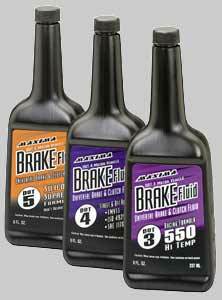 Using racing brake fluid will increase performance of the braking system. Never reuse fluid. º Never mix types or brands of brake fluid. Use smaller fluid containers that can be used quicker. Purge system (complete drain) and replace fluid often. Immediately replace master cylinder reservoir cap following any maintenance.